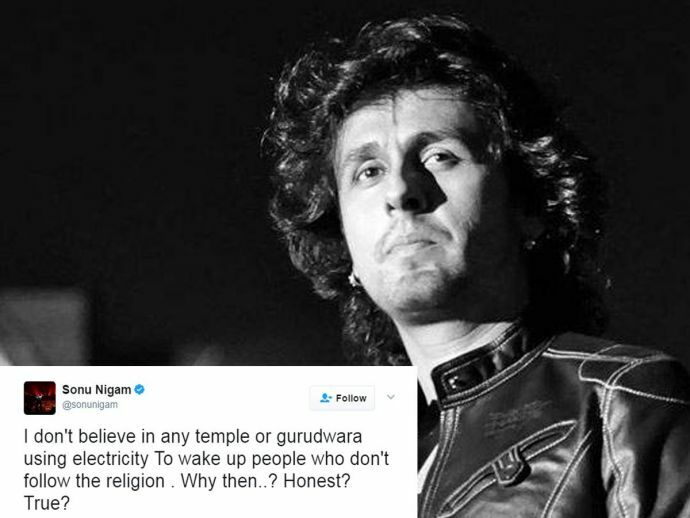 Sonu Nigam Gets Slammed By Twitterati After He Labels Aazan Call As Forced Religiousness! Twitterati compared Sonu Nigam to Abhijeet Bhattacharya, the veteran Bollywood singer infamous for his anti-Islamic comments. Sonu’s tweets have gone viral since then and have garnered mix reactions. While well-known people like Vivek Agnihotri are supporting Nigam, but the majority has slammed him and is even comparing him to veteran singer Abhijeet Bhattacharya, infamously known for his anti-Islamic statements in the past. Here are some of the Twitter reactions to Sonu Nigam’s comments on Azaan. I am willing to sponsor a campaign against illegal blaring of Azaan and other prayers on loudspeakers. Suggest a creative hashtag. Sonu Nigam is feeling left out. Probably feeling that Abhijeet is 'walking away with all the BMKJ glory' ???????? Rules: Sirf 5 baar wala maana jayega.
.@sonunigam who himself used to sing bhajan in "Jagrata" whole night now telling Azan is forced religiousness & Gundagardi. Jai Shree Ram. I am not Hindu, but I lose my sleep to the loud mantras being chanted in the temple at 4 a.m. Get used to it, @sonunigam. Whattey wimp.